AXA has partnered with Publicis Singapore to launch an interactive campaign to raise awareness of the potential dangers of negligent mobile phone use. Called The AXA Mobile Safety Project, the campaign is the third wave of AXA’s global Born to Protect initiative and was conceptualised by Publicis Singapore. The campaign involves an interactive out-of-home installation sited at Orchard MRT to ION Orchard enables members of the public to interact with real-time animations that mirror the pedestrians’ movements. Dramatised light-hearted scenarios in various dangerous situations to deliver the campaign message were also utilised. 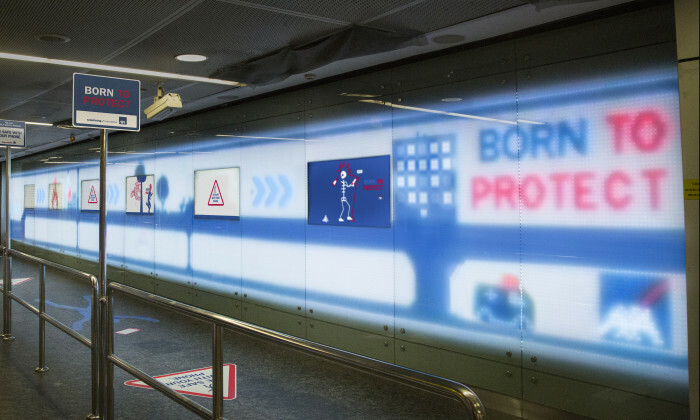 According to Troy Lim, executive creative director, Publicis Singapore, AXA’s Mobile Safety out-of-home installation uses tri-clops motion tracking technology with artificial intelligence to mirror the movements of the passers-by and projects them in various dangerous scenarios. The campaign will run from 17 to 30 November 2016. “This campaign is in line with our mission to protect our customers and by employing the latest innovations in motion tracking and AI to engage passers-by, we hope to encourage people to view safety as a number one priority, not just for themselves but for the people around them,” Leo Costes, managing director, general insurance, AXA Insurance Singapore, said. “Singaporeans love using their mobile phones, and this can result in accidents when they become a part of the “walking distracted”. To highlight the hazards of being a ‘phone zombie’,” Publicis’ Lim said. “While it might seem that you’re in control, you soon realise that perils are unavoidable if you’re constantly on your mobile phone,” Jon Loke, executive creative director Publicis Singapore, added. The 2019 Edelman Trust Barometer also found that trust in traditional media (71%) and search (66%) are now at five-year highs in S..
One advertiser which has come on board is Malaysia Dairy Industries. ..